For a while now I’ve been reading The Complete Collection of HP Lovecraft on my Kindle. I figured it was about time, seeing as I haven’t been very exposed to his work up until this point, and the man has been a huge influence on greats like Stephen King, Allan Moore, Guillermo del Toro, and quite a few more. And since I am always looking to learn from other authors, I figured I should spend ten dollars of Amazon gift cards and see what happens. And as I treaded up the stairs, filled with an anguish that panged the organs within my bosom to no end, I found my wife waiting for me in her chambers, her frown prominently featured upon her face. And I knew that my life had been transferred into a situation seriously detrimental and quite hazardous to my health, for that face on my wife at this hour could only mean that she had discovered my liaisons with Ellen the hotel maid from down in the village. I had endeavored to keep our trysts unknown from all but the walls of Ellen’s room, however it seemed that I was not secretive enough, as evidenced by the porcelain my wife volleyed at my head. Okay, that’s a bit of a parody, but you get my point. Who talks like this? Also, some of his early fiction isn’t that good. “Memory” is just a weird little flash fiction piece about a ruined city and a conversation between two beings about the city; “The Street” is about the houses on the titular street killing Communists after the street goes from a nice neighborhood to a slum; “Polaris” and “The White Ship” are obviously both dreams taken too literally, and “The Tree” is just not scary. Also I noticed that so far, very few women appear in the stories. Several characters are mentioned as having wives, but so far the only woman who has any actual significance is the titular character of “Sweet Ermengarde”, and that’s a story parodying popular romantic melodramas of the day! 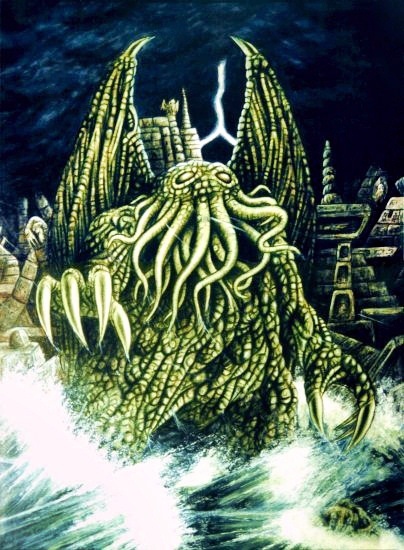 But given that Lovecraft had a strained relationship with his mother, a turbulent one with his wife, and was dominated by his aunts in the later parts of his life, maybe that has something to do with it. Lovecraft makes you wonder if maybe this guy is coming for you. However, while I have my problems with Lovecraft’s early work, I have to admit that some of his stories do hit the mark, and even are a little scary. “The Tomb” is definitely somewhat chilling, as is “Dagon” and “The Picture in the House” (the former bears resemblance to Cthullu stories, while the latter has implications of murder and cannibalism). And I actually very much enjoyed “The Temple”, which was very strange and creepy. I can’t say about the rest of his work, but for the early stuff I think what makes the successes so great is that they leave impressions on you. They make you think to yourself, “Imagine if that actually happened. That would be kind of creepy…” And then you take a look around yourself to make sure that a slippery slimy creature or some guy with wicked magic or something isn’t near you. Lovecraft is very good at leaving those sort of feelings with you. He makes you wonder, makes you think that there’s something just beyond the corners of our eyes or in the darkest parts of our world that we don’t understand, can’t understand, and that any interaction with that something or somethings would be very dangerous for us. So there is definitely a reason why HP Lovecraft has stuck around and become well-known as a writer of weird and terrifying fiction. And as I progress from his early work to the stuff that he’s more famous for, like “Call of Cthullu” or “The Colour out of Space” or “History of the Necronomicon”, I’m sure I’ll find more reasons to like this guy (hence the reason this post is titled Part 1). I can’t think of a better stopping point than on a creepy story that has that weird couplet in it. Can you? The trouble with backtracking in time with horror stories or movies is that we are far more exposed to “horrific” than they were and so what passed as terrifying to them is barely a shrug to us. I think most people read his work now as children or adolescents – before they’ve become as jaded as adults – and so can find something spine chilling, exciting, or new. Because where as he may have done it first, we have all now been exposed to a million rip offs so that the original no longer seems original by the time we get to it, rather a cliche. I had this problem with Bram Stoker’s Dracula. While it was “ok” I would never call it thrilling, astounding, mesmerizing, scary, or even something that kept me turning the pages. had a read it at a younger age I might have found it inspiring, but by the time I got around to it all i could think was “Wow, thank goodness modern vampires are more interesting!” LOL! You know, that might explain it. After all, I’ve been desensitized by slashers and The Conjuring and a lot of Stephen King. Compared to how deep those stories go into terrifying territory, Lovecraft is just scratching the surface, which is why he doesn’t scare me as much. You know Joleene, I’m always learning so much from our conversations. I’m glad we can talk like this. I might try writing one of those later this week, time permitting.